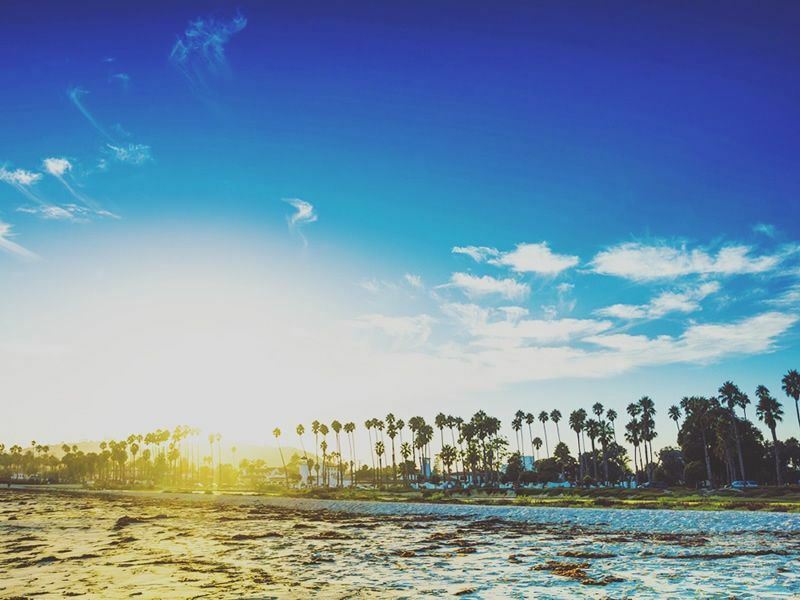 Known as the American Riviera, Santa Barbara features some of California’s most iconic landscape. The city is situated on a stretch of sparkling coastline backed by majestic mountains and surrounded by vineyards. Explore Santa Barbara’s historic buildings and Spanish-style architecture, white-sand beaches, fine dining and wine tasting. Here’s our guide to getting around Santa Barbara, its top attractions, beaches and where to stay. The most convenient way to get to Santa Barbara is to fly into Los Angeles International Airport (LAX). Direct flights go from London Gatwick and Heathrow with a variety of airlines such as Norwegian, Virgin Atlantic, British Airways and United. The journey takes just over 11 hours. 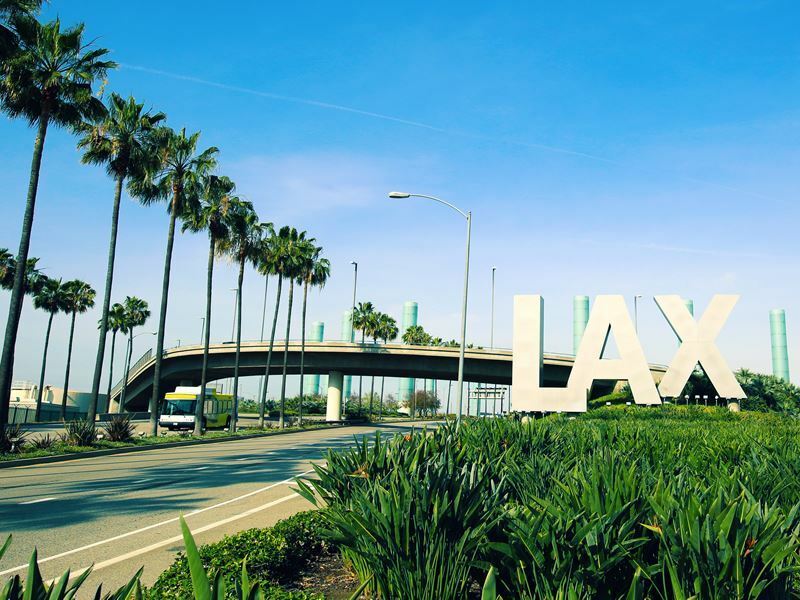 British Airways, United and American Airlines also offer connecting flights from Heathrow to Santa Barbara Airport, changing in Phoenix or San Francisco. You can also fly direct from Manchester to LAX with Thomas Cook Airlines in just under 11 hours. There are connecting flights from other major UK cities such as Edinburgh, Cardiff and Southampton that change in European hubs and take upwards of 13 hours. Internal flights from LAX to Santa Barbara Airport take just under an hour with United Airlines. 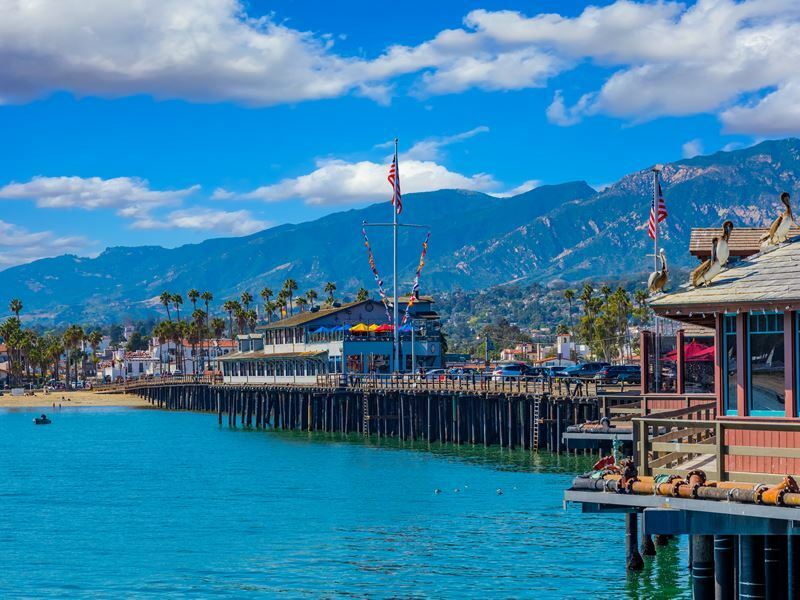 Most visitors incorporate Santa Barbara into a California road trip, travelling along the scenic Route 1 Pacific Coast Highway and the 101. From LA, Santa Barbara is a two-hour drive north, then you can head up the coast to San Luis Obispo County, Big Sur and the San Francisco Bay area. Located just west of the city, Goleta is home to Santa Barbara Airport, the University of California and the annual Californian Lemon Festival. Visit Isla Vista, cycle along the coastal bike path or check out the Butterfly Preserve. Goleta also has shopping centres and a beach ideal for paddleboarding, as well as surfing at Campus Point. Head to the nearby mountains to trek The Playgrounds hiking trail. Lies just east of Santa Barbara and is one of the wealthiest suburbs in the country. The area has been attracting the rich and famous since the 1880s and today, stars such as Oprah Winfrey own houses in Montecito. Head to the Upper Village and Coast Village Road for luxurious restaurants and shopping. There are 15 hill trails nearby with sweeping ocean views, as well as pristine sands with calm waters at Miramar and Butterfly Beach. Travel slightly further east and you’ll hit Summerland, a surf town known for its stellar antique shopping. There’s a quiet vibe, with plenty of local eateries and a peaceful beach below Lookout Park, a common horse riding spot. You can also do some wine tasting or wander the quaint Main Street. Located slightly north of Santa Barbara, this area is home to La Cumbre Peak, the highest point in the Santa Ynez Mountains. Mission Canyon is a good starting point for hikes, with a number of trails. You’ll also find Rocky Nook Park and nearby, the Santa Barbara Museum of Natural History and the Botanical Gardens. Drive 40 minutes northwest of Santa Barbara to this picturesque valley, home to over 200 wine tasting rooms and made up of six small towns. Santa Ynez itself is a vintage cowboy settlement, while the village of Solvang was founded by Danish-Americans and boasts windmills, farms and traditional bakeries. You’ll find more Old West heritage in Los Alamos, as well as award-winning breweries in Buellton and wine tasting in Los Olivos. Tiny Ballard is worth a stop for its rustic churches and miniature donkeys. Santa Barbara’s most famous historical landmark was founded by Spanish Franciscans back in 1786 and remains home to friars today. The Old Mission is the last of the 21 missions set up in California that’s still active and its colonial architecture is echoed throughout Santa Barbara. Take a tour of the buildings and grounds, which include a museum, gardens and a cemetery. Stroll around this busy wharf, which was built in 1872 and lies at the bottom of State Street. Stearns Wharf offers incredible harbour views and is full of shops, restaurants and bars. Relax on West Beach, walk or cycle along the waterfront or even fish off the pier. Santa Barbara Wine Country has a unique climate that produces over 50 varieties of wines, from Chardonnays to Sauvignon Blancs and Pinot Noirs. The best way to sample them is to take the Urban Wine Trail, which winds through downtown to the beach and includes 26 tasting rooms. In many, you can pair tastings with chocolates and cheeses. 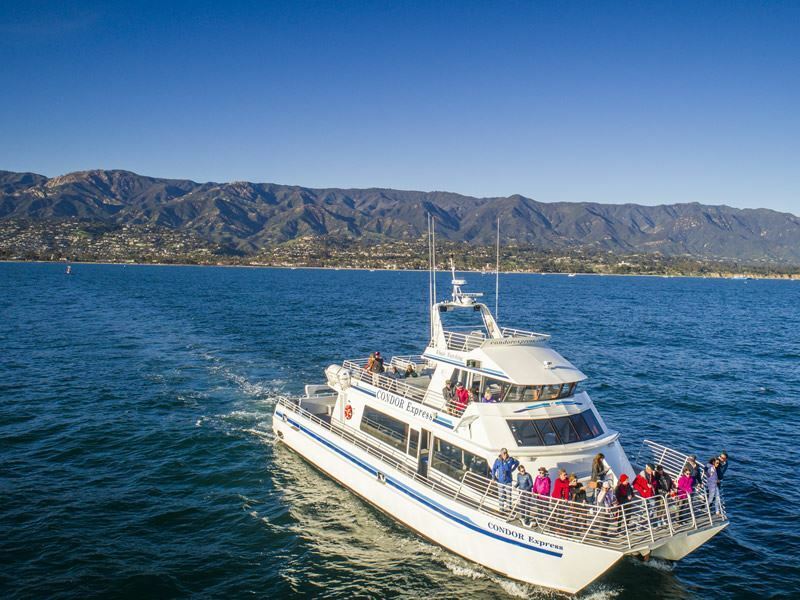 Popular stops include the Deep Sea on Stearn’s Wharf and Grassini Family Vineyards. Come to California’s oldest operating theatre, established in 1873, for concerts, music, operas and films. The Lobero is the hub of Santa Barbara’s performing arts scene and hosts the Santa Barbara International Film Festival, as well as ballets, plays and orchestras. Other theatre venues in the city include the Spanish-style Arlington Theatre and the Granada Theatre, established in 1924. 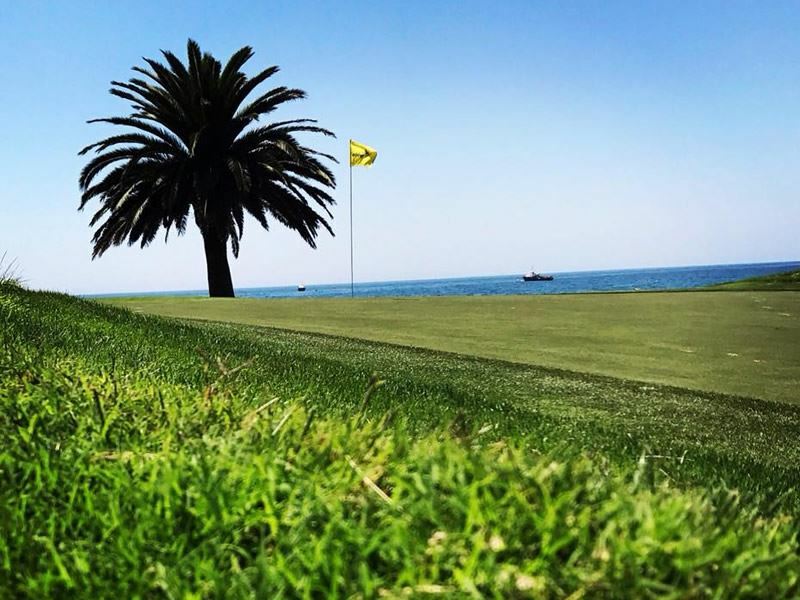 Santa Barbara has a range of public and private golf courses with ocean and mountain views. Each club has its own personality, the 18-hole Sandpiper Golf Club is a public 7,000-yard course with an ocean backdrop. The Montecito Country Club is set up in the hills, while the Santa Barbara Golf Course is another favourite option. Most are located centrally, in downtown or along the waterfront. Start with the Santa Barbara Historical Museum which details 500 years of regional history. The Maritime Museum near the harbour tells the area’s seafaring history through interactive exhibitions and don’t miss the Santa Barbara Museum of Art. Other top picks include the South Coast Railroad Museum, Sea Center and Lotusland. Spend time swimming in the Pacific Ocean, sailing, surfing and paddle boarding, or explore the area by kayak. There are stunning sea caves to discover in the nearby Channel Islands National Park. Companies such as Cal Coast Adventures and Santa Barbara Sailing Company rent out equipment and organise charters. Thanks to Santa Barbara’s year-round fine climate and light winds, it’s the perfect place for a hot air balloon ride. Float over the hills, coastline and ocean at sunset or sunrise for spectacular views. The House of the Blacksmith dates back to the 1920's and is located in Montecito. The Casa del Herrero is one of the best examples of Spanish Colonial Revival architecture in the whole of America and is listed on the Register of Historic Places. Tour the building and its Moorish-inspired gardens. For similar architecture, visit the Santa Barbara Courthouse, which has hand-painted ceilings, tiled corridors, a clock tower and mural room depicting the history of the city. Over 27 species of dolphins and whales swim in the Santa Barbara Channel, along with sea lions. These include Humpback, Gray, Orcas and Blue whales that you can spot on a whale watching tour with a company like Sunset Kidd or Condor Express. The best time for tours is between May and November, when Gray whales migrate and Blue and Humpback whales are feeding. Nestled between the Pacific Ocean and Santa Ynez Mountains, the club is spread over 87 acres and features clubhouses, stables, eight tennis courts, a pool and Jacuzzi. 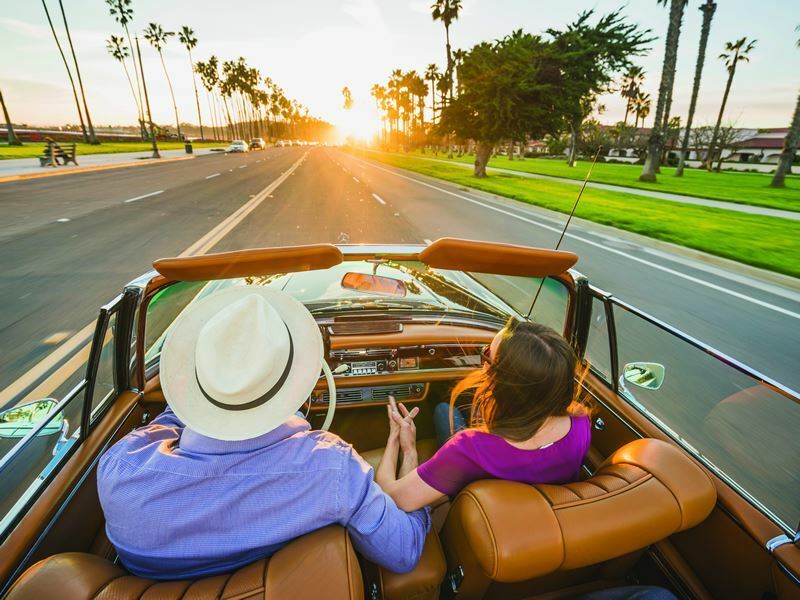 June is a great time to visit for the Summer Solstice Celebration with a parade and live music, while the Santa Barbara Wine and Food Festival and California Wine Festival take place in July. Other options include the Goleta Lemon Festival, Old Spanish Fiesta Days and April’s Earth Day. Looking for some retail therapy? 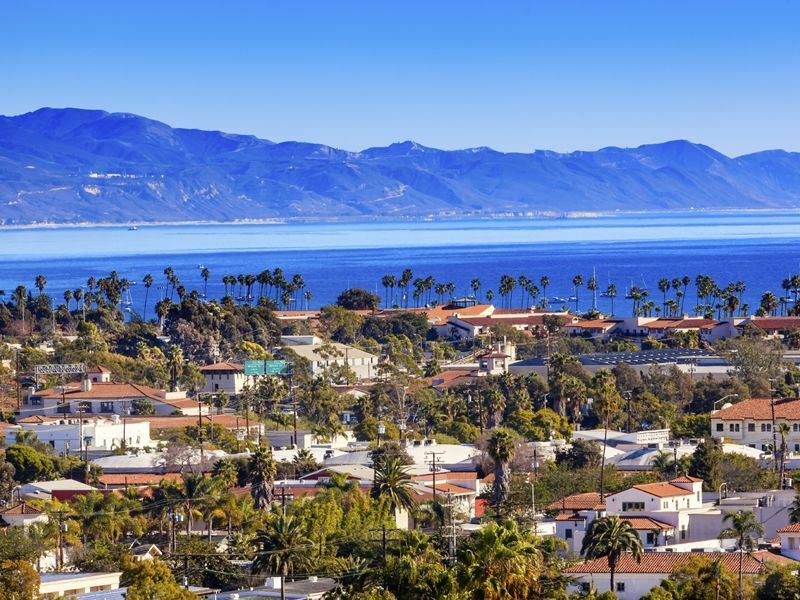 Santa Barbara has everything from beach souveniers to designer stores and open-air shopping plazas. State Street has a variety of well-known shops and the Paseo Nuevo outdoor mall. La Arcada offers vintage shopping and luxury boutiques, while La Cumbre Plaza is a modern mall located uptown with the biggest range of shops. Head to Stearn’s Wharf and the harbour for souveniers and beach accessories. 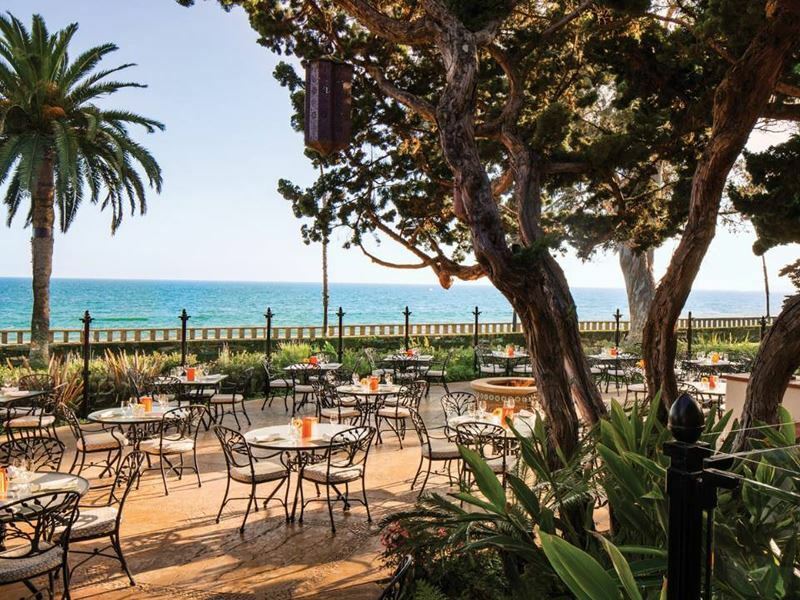 If you’re stopping in Santa Barbara as part of a Californian road trip, be sure to check out some of the central coast’s nearby hotspots. 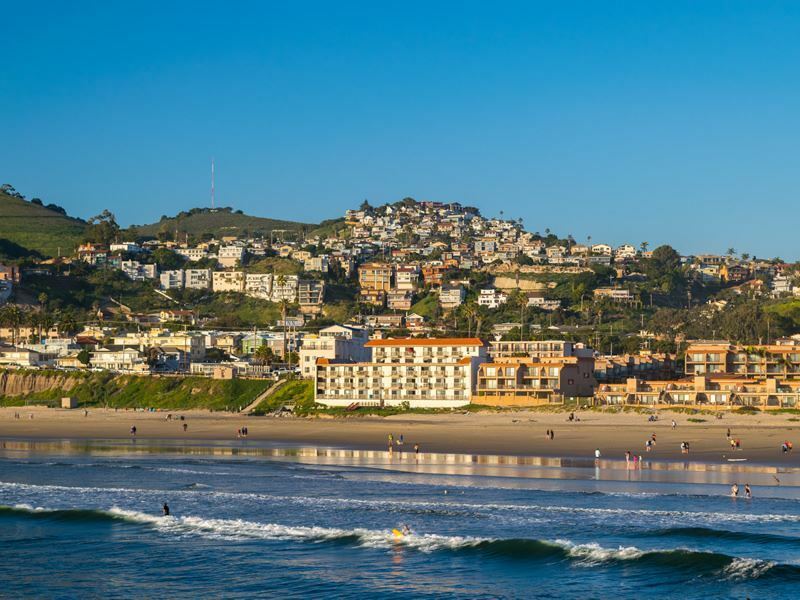 These include Pismo Beach and San Luis Obispo County, which has 80 miles of beaches and a thriving art, food and wine scene. 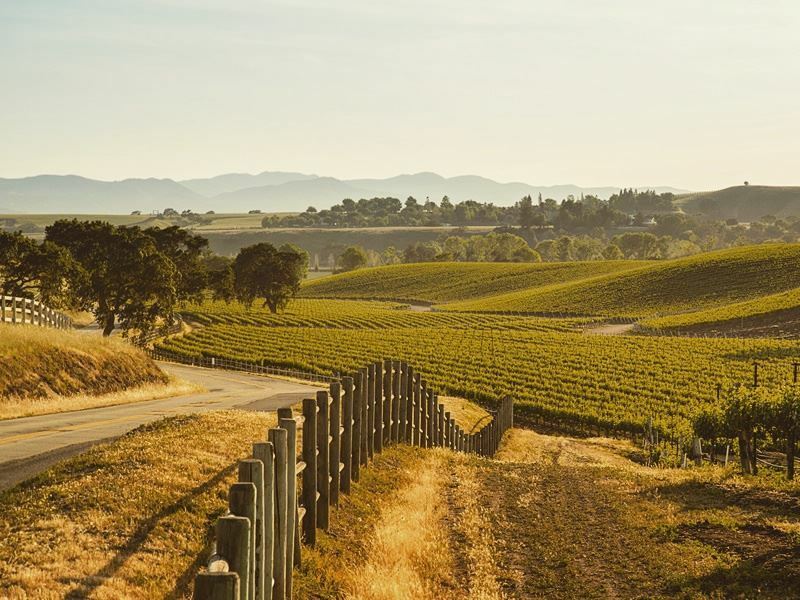 Enjoy outdoor adventures such as hiking and watersports and visit three wine regions: Paso Robles, Edna Valley and Arroyo Grande. Don’t miss the grand Hearst Castle and take a trip to Los Padres National Forest for hiking, camping and fishing.